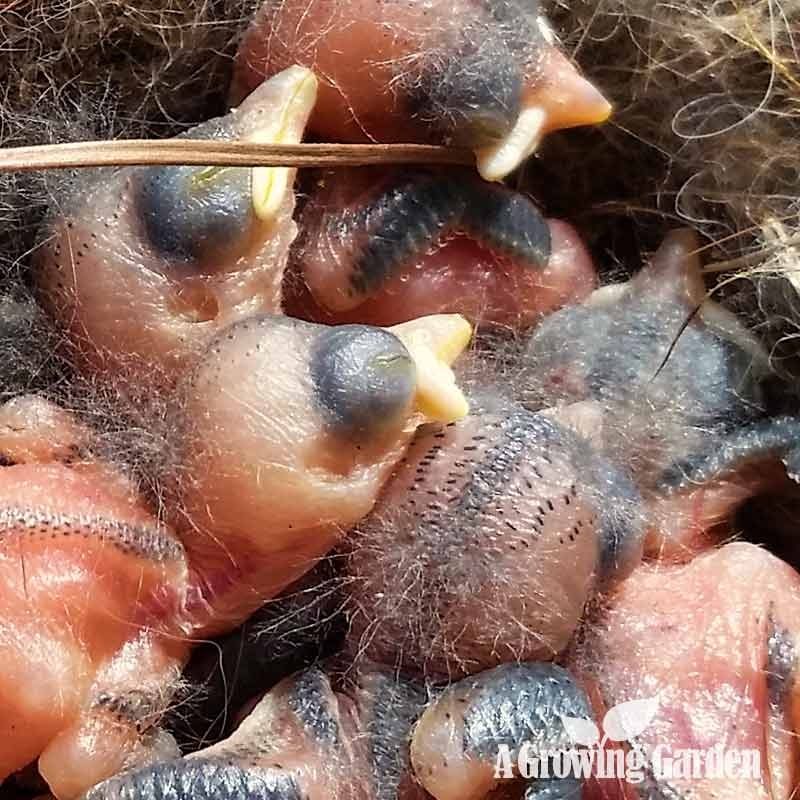 Sometimes I'm amazed that any baby bird survives long enough to make it out of nest, let alone to grow into an adult bird ... it just seems like nature isn't on their side! We've had lots of problems over the years with snakes and other predators and we've implemented all sorts of things to try to keep our baby birds as safe as possible. 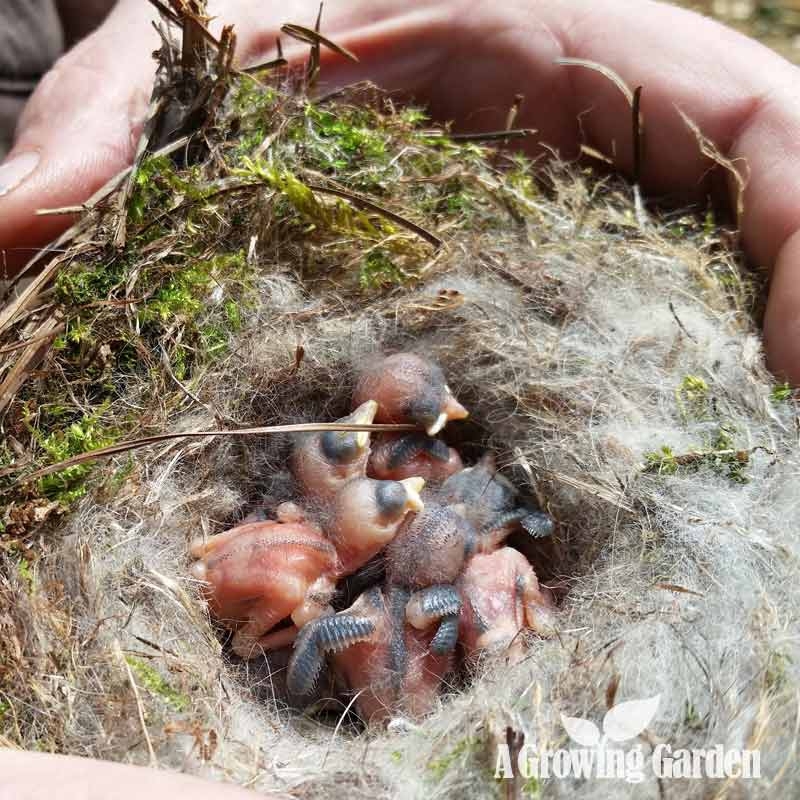 But, just like with gardening, each year seems to bring it's own set of problems and this morning we came across a new one for our nest boxes and baby birds ... ants. As you may remember, we place 1/4" bird netting at the bottom of the poles that our bird nest boxes are mounted on so that snakes cannot slither up the poles and eat the eggs or baby birds. It works well! However, we also try to be very careful not to kill or hurt the snakes either (they do a lot of good too! ), so we check the netting at least 2 or 3 times a day in order to be able to quickly free any snake (or other critter) that may have gotten itself stuck. 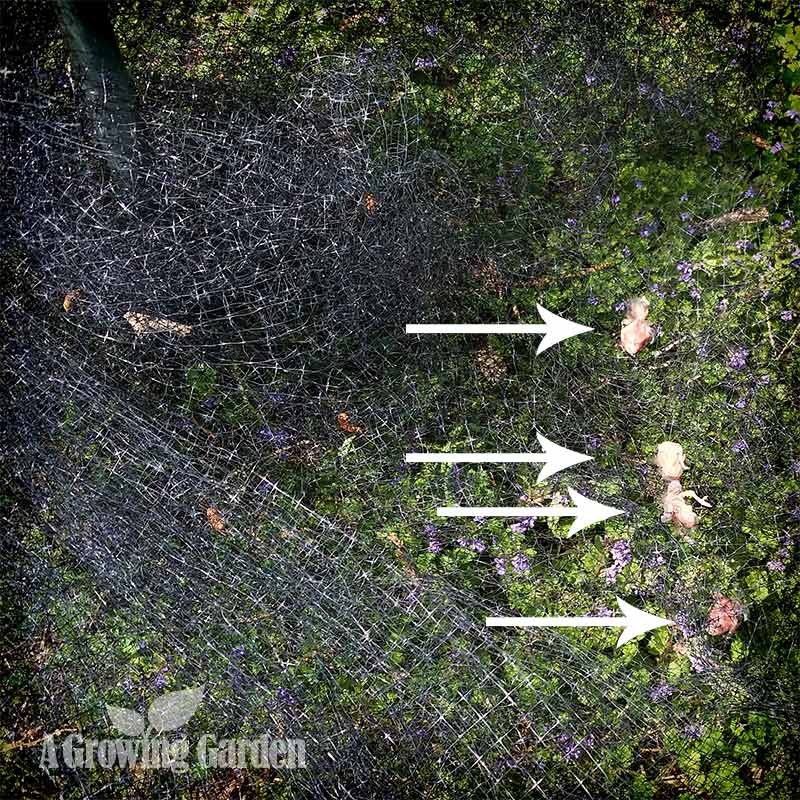 As such, we've gotten into the habit of looking at the netting around every birdhouse we have whenever we're near by. One of our bluebird nesting boxes is mounted in our front yard between our house and our garden. We walk by it a lot. It usually houses bluebirds, but a little Carolina Chickadee took it over earlier this spring and made a messy little nest and laid 7 eggs in it. I haven't been checking on the nest every day like I do with the bluebirds because the chickadee mother is the bravest little bird I've ever seen and refuses to leave the nest when I open the door to the box. I imagine that it really freaks her out to have my big head coming so close to her and her nest, so I haven't been looking in and I had no idea if the babies had hatched yet or not. Yesterday, as I was walking back from a trip to the garden, I noticed that the bird netting at the base of the box with the chickadee nest was moving ever so slightly. I was standing in our driveway and about 30 or so feet away from nesting box. Not really wanting to walk over to the box (yes, I'm a bit lazy! ), I stood there and just watched the netting. Something was definitely moving ... not anything large, and not a snake ... but definitely something. I thought that maybe a bumblebee had gotten it's fat self stuck in the netting. Afterall, we have creeping charlie ALL over the yard (see it blooming in the photo above?) and the bees absolutely love that little purple weed! But, that seemed unlikely and I just couldn't figure it out. My husband saw me standing in the driveway staring into space and came out to see what the heck I was doing. He stood with me and we both stared at the base of the birdhouse trying to figure out what mysterious creature could possibly be moving the netting. After a minute or 2, curiousity took over and we headed over to take a closer look. 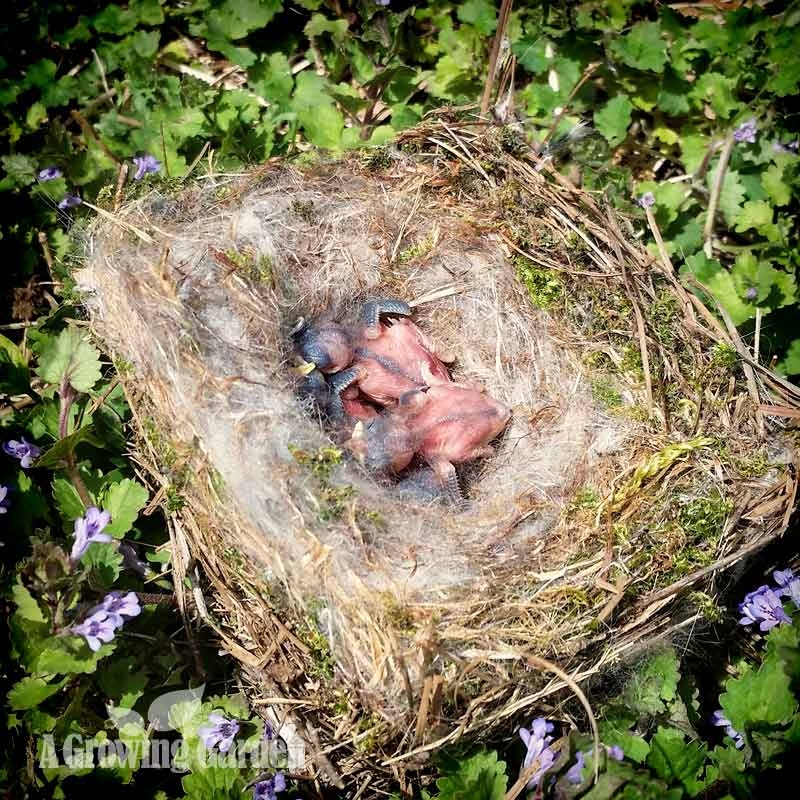 There were 4 tiny baby chickadees flopping around in the netting! Here's a close up of the baby birds. 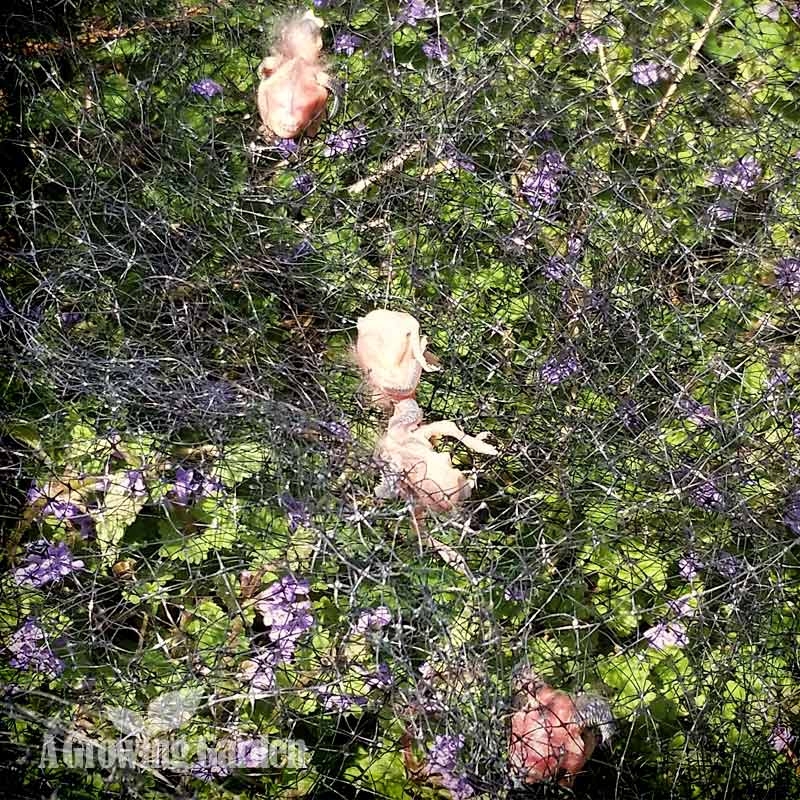 As you can see, three of the birds were just sort of on top of the netting and one was tangled a bit in it. They didn't look to be more than a few days old and they were just kind of flopping around. They were crying and so, so tiny! The chickadee nest was teeming with little black ants! Even though there were still two babies in the nest, we didn't think it was a good idea to put the birds back into the nest with the ants. After all, we assumed that the ants must have somehow done something to make the babies try to get out. So, instead of just putting the babies back into the nest, we pulled out the nest and cleaned the entire box with a brush to get the ants out. The nest itself was also full of ants (which were now crawling all over me as I held it!) and we needed to do something to get the ants out of the nest too. So, we temporarily removed all of the babies from the nest and took the nest inside the house. Without having a replacement nest around and not really knowing what to do to get rid of the ants, we decided to pop it in the microwave on high for about a minute. I have NO idea if anyone else would do such a thing, and, I'm not suggesting that anyone do it if you find ants in a nest (after all, we were VERY, VERY worried that the nest might catch on fire inside the microwave (it didn't luckily! )), but it seemed to have worked & got rid of any remaining ants. We then carefully placed all seven baby birds back into the little nest and put the nest back into the box. Once the nest and the babies were back in the box, we closed everything up and within a few minutes the parents were both back and tending to the babies. (Whew!) We then "greased" the pole with axle grease to help to keep the ants from coming back. Fingers crossed that it works! I later checked on the baby birds and they were sleeping calmly in their ant-free nest. I don't really know what made the birds try to leave the nesting box when they were so small (their eyes aren't even open yet!) ... my guess is that the ants were biting them, but I really don't know. I've read that fire ants will kill and eat baby birds, but these were small black ants, so I just don't know what was happening inside the box... I just hope it doesn't happen again!